Escalade is a stunning black 6-year-old male, born March 14, 2000. His sire is Montechina and his dam is Okie Voyager. Escalade has 79 races to his credit starting July 25, 2001 at Southland in West Memphis, Arkansas, moving to two tracks in Florida, Hollywood and Flagler, before his last race on November 11, 2003. 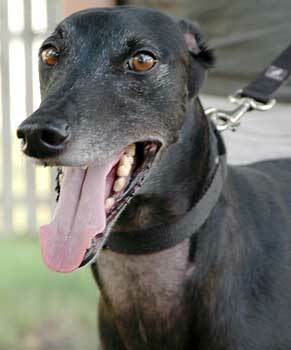 From there Escalade went on to help other dogs as a blood donor for a period of time, before truly retiring with GALT. 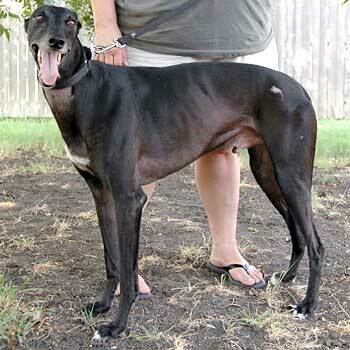 Escalade has a handsome and shiny black coat that sets him apart from many. Escalade is not small animal or cat tolerant. Escalade is one beautiful, playful, silly, happy boy! He just wants to be wherever people are, and especially loves to lean, cuddle and touch. He really gets excited when someone will lie down on a dog bed or the floor with him: he'll stretch out alongside and snuggle! He has learned how to be a very good dog inside the house and has had no accidents since the very first few days. He quickly learned how to play with stuffies and enjoys taking them out thru the dog door to his favorite spot in the yard. He cannot be trusted with cats but does just fine with small dogs. He isn't interested in "people food" but will do anything for a doggie treat or an ear scritch. Escalade loves to roach and show you his belly so you can, of course, rub it. 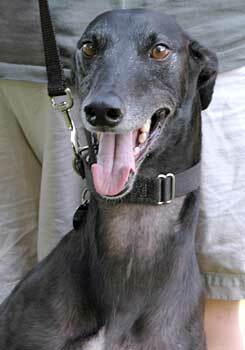 Escalade loves children, and he plays beautifully with my other greyhounds and my mutts. I feel that he would be just fine as a single dog, as long as his new home had enough activity (and hopefully children!) for him to enjoy. He is absolutely wonderful in the car and on walks, and just wants a home of his own so he can start his new life as a beloved pet. Come meet him and see how amazing this little boy is! He'll be your best friend for life. All he needs is someone to love and to call his own.